What an amazing experience it was. This year’s AKS (Acute Coronary Syndrome) as in previous years, was really well visited. 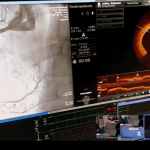 Loads of new things to learn, for cardiologists and other medical professionals and enthusiasts, both young and old. 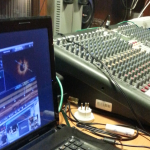 I was asked to organize, set up and most of all run a LIVE transmission of a LIVE case to the venue. 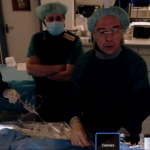 We had 280+ visitors viewing a LIVE CASE of “OCT guided implantation of a BIORESORBABLE stent” the new and hottest “thing” in interventional cardiology. My brother dr. Blaz Mrevlje, MD and Prof. Dr. med. 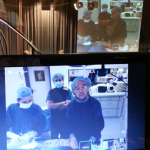 Christoph A. Nienaber, both of Rostock University Clinical Center presented the case while “operating” on a patient. 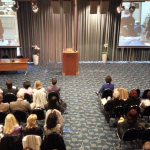 The audience was intrigued, mesmerized and glued to the two big screens both showing three different video/audo feeds (the procedure with angiogram and OCT screen, the table with the actual procedure and the guest speakers). With this being a LIVE CASE on a LIVE patient this was more of a “thriller” then a static presentation. We are planning on broadening “LIVE transmissions” to other hot topics in the very near future. Looking very much forward to being a part of this and feeling honoured to be able to provide my skills and services for such events and esteemed professionals on an international level.